Abhiyum Naanum is a 2008 Indian Tamil costume drama film released on Dec 19, 2008. The film is directed by Radha Mohan, produced by Prakash Raj. During a walk to the park Raghuraman (Prakash Raj) meets Sudhakar (Prithviraj Sukumaran) and tells him about daughter Abhi (Trisha Krishnan). Raghuraman is the loving husband of Anu (Aishwarya Sivachandran) and the worrisome as well as caring father of his only daughter Abhi. Together they live a calm and content life in Ooty. Also living with them is "Ravi Shastri" (Elango Kumaravel) who was earlier a beggar and was adopted by Abhi. Raghuraman and Abhi become best friends. 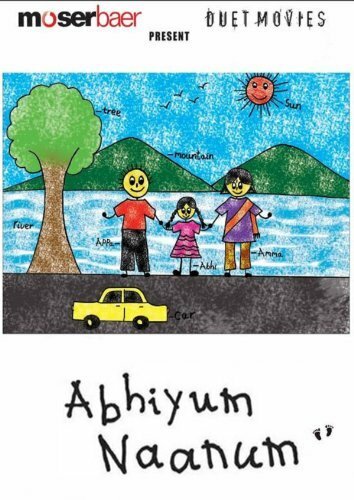 Over the years as Abhi grows up, Raghuraman has the joy of being a part of her life. When Abhi gets accepted in a prestigious college in New Delhi, Raghuraman is shocked. Although the thought of being separated from his daughter for two whole years is heartbreaking, Raghuraman wearily accepts. After returning from college, Abhi tells her parents that she has fallen in love with a young man in Delhi. Anu is perfectly alright with the idea, but Raghuraman is angry and scared. Anu later informs Raghuraman that their future son-in-law will be arriving by flight and staying with them for a while. As soon as Raghuraman meets his future son-in-law, Joginder Singh (Ganesh Venkatraman), he is taken aback because Joginder is a Sikh. After many conflicts with Abhi and Anu, Raghuraman finally realizes that Joginder is self-sacrificing and quite talented, more so when on one occasion the Prime Minister calls him for advice. During a walk to the park Raghuraman (Prakash Raj) meets Sudhakar (Prithviraj Sukumaran) and tells him about daughter Abhi (Trisha Krishnan). Raghuraman is the loving husband of Anu (Aishwarya Sivachandran) and the worrisome as well as caring father of his only daughter Abhi. Together they live a calm and content life in Ooty. Also living with them is "Ravi Shastri" (Elango Kumaravel) who was earlier a beggar and was adopted by Abhi. Raghuraman and Abhi become best friends. Over the years as Abhi grows up, Raghuraman has the joy of being a part of her life. When Abhi gets accepted in a prestigious college in New Delhi, Raghuraman is shocked. Although the thought of being separated from his daughter for two whole years is heartbreaking, Raghuraman wearily accepts. After returning from college, Abhi tells her parents that she has fallen in love with a young man in Delhi. Anu is perfectly alright with the idea, but Raghuraman is angry and scared. Anu later informs Raghuraman that their future son-in-law will be arriving by flight and staying with them for a while. As soon as Raghuraman meets his future son-in-law, Joginder Singh (Ganesh Venkatraman), he is taken aback because Joginder is a Sikh. After many conflicts with Abhi and Anu, Raghuraman finally realizes that Joginder is self-sacrificing and quite talented, more so when on one occasion the Prime Minister calls him for advice. Check out this page for more updates on Abhiyum Naanum. This page provides latest and updated information about Abhiyum Naanum (2008) movie which released on Dec 19, 2008. Abhiyum Naanum (2008) is directed by , produced by , starring .We have also provided 0 trailers and videos, 5 photos, 11 user reviews, and 0 critic reviews.Abhiyum Naanum (2008) has received 4.3 rating from user reviews.The overall rating of Abhiyum Naanum (2008) is 85 and movie is 4.3.You can review, like, dislike this movie and also can add to favorites. You can also find information on showtimes, CDs, DVDs, online rental, online free watching.